The abundant rain from the end of August through October resulted in a lot of fungal diseases and delayed harvest. Many pods were infected by Diaporthe species of fungi, which can lead to stem canker, pod and stem blight, and Phomopsis seed decay. Shown below are guidelines to follow in order to prevent fungi in crops. Include fungicide seed treatments. A fungicide seed treatment helps to maintain the quality of the seed and increase germination potential. 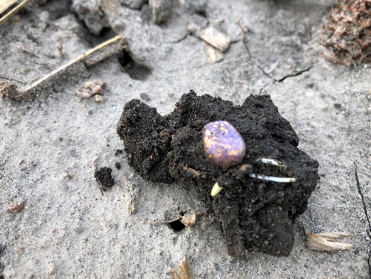 Give your soybean crop the best possible start by planting in to warm soils, favorable growing conditions, and a good seedbed. If you have questions on soybean seed quality and what seed treatment to use on the seed that you have purchased check with your local agronomist and/or seed provider. Limit handling. Throwing or dropping seed bags can reduce germination. Consider installing a soft surface for the seed to land on in tenders, drills, and other equipment. Causes of poor seed germination are most generally from either poor seed to soil contact or dry soil conditions. Soybeans will imbibe (absorb) two to five times their weight in water while corn only 1.5 to two times its weight. Soybeans must imbibe about 50% of their weight in water while corn is about 30%. 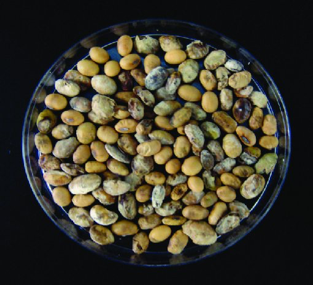 However, since soybeans are approximately 2/3 the weight of corn kernels, the total amount of absorbed water required for germination is relatively similar. With seeds sitting in dry or cloddy soils, this process happens very slowly, or not at all. Ideally, rain will help saturate the seedbed and get the emergence process started. For the radicle to emerge and begin elongation, soil temperatures must be conducive for germination to occur. The commonly acceptable soil temperature is 50°F or above. Corn is susceptible to cold stress during imbibition, so warmer, moist conditions for the first 24-48 hours after planting is preferred to help eliminate much of the cold stress. Choosing hybrids with a higher stress emergence/tolerance score can help reduce vulnerability to stand loss due to cold temperatures. If a cold front is moving in to your area during planting, it is advisable to stop planting 24 to 48 hrs. in advance. Allow seed to begin absorbing water in warmer soils in order to minimize damage due to cold imbibition. In sandy or lighter soil fields, be aware that low nighttime temperatures can lower soil temperatures below advisable planting levels. Large temperature swings in lighter soils can hinder emergence. If planting in fields with high amounts of residue, consider strip-tillage or use a row cleaner to allow soils to warm up quicker. Selecting hybrids with higher stress emergence/tolerance scores and the correct seed treatment can help reduce the risks associated with planting in cold-stress conditions. 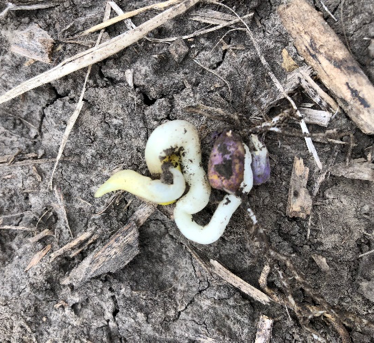 As you can see, many of the factors of poor seed emergence stem from less than ideal soil and atmospheric conditions so having patience in the spring can pay off to ensure good emergence. When it does come time to plant, SureForce can provide proper seed to soil contact for uniform emergence and stand. Be SAFE and good luck with the upcoming planting season!